For other uses, see Icarus (disambiguation). Icarus /IK-uh-russ/, Ikaros Ἴκαρος Greek: ‘mallet, chopper’. Compare with ἴκαρ (= τακέως) ’at a strike, immediately’ and ἴκρια ‘wooden partition (as on a stage), compartment; abatis, entanglement’ and Latin īco ‘to strike, hit, smite, stab, sting’; ictus ‘a blow, stroke, thrust, bite, sting, a beat’. Daedalus /DED-uh-luss/, /DEED-uh-luss/, Δαίδαλος anciently /DIGH-dah-lohs/, ‘art, skill, craft, trade, profession’ (German Kunst); thus 'cunningly wrought'. Icarus's father Daedalus, a very talented and remarkable Athenian craftsman, built the Labyrinth for King Minos of Crete near his palace at Knossos to imprison the Minotaur, a half-man, half-bull monster born of his wife and the Cretan bull. Minos imprisoned Daedalus himself in the labyrinth because he gave Minos's daughter, Ariadne, a clew (or ball of string) in order to help Theseus, the enemy of Minos, to survive the Labyrinth and defeat the Minotaur. Hellenistic writers give euhemerising variants in which the escape from Crete was actually by boat, provided by Pasiphaë, for which Daedalus invented the first sails, to outstrip Minos' pursuing galleys, and that Icarus fell overboard en route to Sicily and drowned. Heracles erected a tomb for him. Icarus' flight was often alluded to by Greek poets in passing, but the story was told briefly in Pseudo-Apollodorus. In the literature of ancient Rome, the myth was of interest to Augustan writers. Hyginus narrates it in Fabula 40, beginning with the bovine love affair of Pasiphaë, daughter of the Sun, resulting in the birth of the Minotaur. Ovid narrates the story of Icarus at some length in the Metamorphoses (viii.183–235), and refers to it elsewhere. 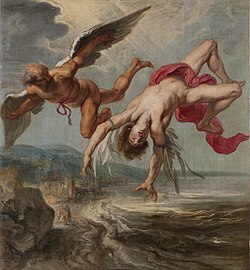 Ovid's treatment of the Icarus myth and its connection with that of Phaëthon influenced the mythological tradition in English literature as received and interpreted by major writers including Chaucer, Marlowe, Shakespeare, Milton, and Joyce. 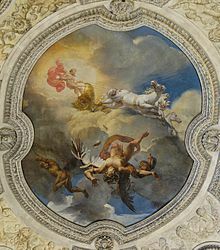 In Renaissance iconography, the significance of Icarus depends on context: in the Orion Fountain at Messina, he is one of many figures associated with water; but he is also shown on the Bankruptcy Court of the Amsterdam Town Hall – where he symbolizes high-flying ambition. The 16th-century painting Landscape with the Fall of Icarus, traditionally but perhaps erroneously attributed to Pieter Bruegel the Elder, was the inspiration for two of the 20th century's most notable ecphrastic English-language poems, "Musée des Beaux Arts" by W. H. Auden and "Landscape with the Fall of Icarus" by William Carlos Williams. Other English language poems referencing the Icarus myth are "To a Friend Whose Work Has Come to Triumph" by Anne Sexton, "Icarus Again" by Alan Devenish, "Mrs Icarus" by Carol Ann Duffy, "Failing and Flying" by Jack Gilbert, and "Icarus Burning" and "Icarus Redux" by Hiromi Yoshida. Literary interpretation has found in the myth the structure and consequence of personal over-ambition. An Icarus-related study of the Daedalus myth was published by the French hellenist Françoise Frontisi-Ducroux. In psychology there have been synthetic studies of the Icarus complex with respect to the alleged relationship between fascination for fire, enuresis, high ambition, and ascensionism. In the psychiatric mind features of disease were perceived in the shape of the pendulous emotional ecstatic-high and depressive-low of bipolar disorder. Henry Murray having proposed the term Icarus complex, apparently found symptoms particularly in mania where a person is fond of heights, fascinated by both fire and water, narcissistic and observed with fantastical or far-fetched imaginary cognition. Seth Godin's 2012 The Icarus Deception points to the historical change in how Western culture both propagated and interpreted the Icarus myth arguing that "we tend to forget that Icarus was also warned not to fly too low, because seawater would ruin the lift in his wings. Flying too low is even more dangerous than flying too high, because it feels deceptively safe." ^ Wilhelm Pape [1807-1854]: Wörterbuch der griechischen Eigennamen [von] W. Pape [und] G[ustav] Benseler, ed. 3, Braunschweig, 1911, Verlag von Friedrich Vieweg & Sohn. ^ clew – a ball of yarn or thread. The etymology of the word "clue" is a direct reference to this story of the Labyrinth. ^ Thomas Bullfinch - The Age of Fable Stories of Gods and Heroes KundaliniAwakeningSystem.com & The Internet Classics Archive by Daniel C. Stevenson : Ovid - Metamorphoses - Book VIII + Translated by Rolfe Humphries - KET Distance Learning 2012-01-24. ^ Translated by A. S. Kline - University of Virginia Library.edu Retrieved 2005-07-03. ^ Smith, William (ed.). A Dictionary of Greek and Roman Biography and Mythology. ^ Pinsent, J. (1982). Greek Mythology. New York: Peter Bedrick Books. ISBN 0-600-55023-0. ^ Epitome of the Biblioteca i.11 and ii.6.3. ^ Gareth D. Williams, Banished voices: readings in Ovid's Exile Poetry (Cambridge University Press, 1994), p. 132 online. ^ Peter Knox, A Companion to Ovid (Blackwell, 2009), p. 424 online. ^ Jane Chance, The Mythographic Chaucer (University of Michigan Press, 1995), p. 65 online. ^ Troni Y. Grande, Marlovian Tragedy (Associated University Presses, 1990), pp. 14 online, 40–42 et passim; Frederic B. Tromly, Playing with Desire: Christopher Marlowe and the Art of Tantalization (University of Toronto Press, 1998), p. 181. ^ Coppélia Kahn, Man's estate: Masculine Identity in Shakespeare (University of California Press, 1981), p. 53 online. ^ Su Fang Nu, Literature and the Politics of Family in Seventeenth-Century England (Cambridge University Press, 2007), p. 154 online; R.J. Zwi Werblowsky, Lucifer and Prometheus (Routledge, 2001, reprinted from 1952), p. 32 online. ^ R. J. Schork, Latin and Roman Culture in Joyce (University Press of Florida, 1997), p. 160 online. ^ E. H. Gombrich, Symbolic Images; Studies in the Art of the Renaissance (London, 1972); p. 8. ^ Frontisi-Ducroux, Françoise (1975). Dédale: Mythologie de l'artisan en Grèce Ancienne. Paris: François Maspero. p. 227. ^ Wiklund, Nils (1978). The icarus complex. Lund: Doxa. ISBN 91-578-0064-2. ^ Pendulum - The BiPolar Organisation's quarterly journal Bipolar UK Retrieved 2012-01-24. ^ results, search (31 December 2012). The Icarus Deception: How High Will You Fly? (1st ed.). Portfolio. ^ Comparion noted by W.H.Ph. Römer, "Religion of Ancient Mesopotamia," in Historia Religionum: Religions of the Past (Brill, 1969), vol. 1, p. 163. This page was last edited on 22 April 2019, at 04:41 (UTC).